Niagara RL May.10 Edmonton S.
The Niagara River Lions Professional Basketball Club has named Victor Raso to serve as Head Coach and General Manager for the 2019 Canadian Elite Basketball League season. The CEBL begins play in May 2019 in six cities across Canada. Raso joined the River Lions for the 2017-18 season as Lead Assistant Coach, and he played a large role in the team's success, helping guide them to the most wins in franchise history and their first playoff win. The River Lions began the search for their new bench boss this past fall, and it was Raso's prior experience and relationship with the River Lions organization that stood out amongst the candidates. River Lions President Jeffrey Sotiriou is confident that Raso's transition to head coach will be seamless. 'Victor has proven to be a hardworking and talented coach. When Victor joined the River Lions last season, we were immediately impressed with his professionalism, work ethic, and modern approach to the game,' said Sotiriou. Raso brings a fresh perspective with experience in both playing and coaching for Canada's top university basketball program. He won back to back CIS national titles in 2013 and 2014 as captain with Carleton University before taking on the role of Assistant Coach for the Ravens, where he earned his third championship title alongside Canadian U Sports legend Dave Smart. 'I am excited to build a team of like-minded people who value growth, dedication, and a passion for the game of basketball as much as I do,' Raso added. 'Together, we will do everything we can to bring a national championship to the Niagara Region and to our amazing River Lions fans." The River Lions are joined by Guelph, Hamilton, Saskatchewan, Edmonton and Fraser Valley as the original six teams in the CEBL. Each team will include a minimum of 70 percent Canadian players. Teams will play a 20-game regular season schedule from May through August 2019. Season tickets are available now at riverlions.ca/tickets. HAMILTON, ONT - The Canadian Elite Basketball League (CEBL) revealed all the top talent that was drafted by the league's six teams in its first ever Entry Draft on Saturday, March 23, 2019. The draft reveal took place at the Art Gallery of Hamilton in front of media, sports and lifestyle influencers, prominent basketball personalities and executives. The Fraser Valley Bandits had the first overall pick in the regional rounds and selected 6-foot-5 guard Joel Friesen, a Fraser Valley native who played for the University of the Fraser Valley and the University of Alberta before launching his professional career in 2015.
territories, allowing each team to have a nucleus of players from its own region. Commencing with Round Five, the draft opened up for all teams to select players from any region of the world. Edmonton, February 19, 2019 - The Edmonton Stingers, member club of the Canadian Elite Basketball League (CEBL), are elated to introduce Barnaby Craddock as the first-ever head coach and general manager in franchise history. Coach Craddock has been coaching with Canada Basketball National team program since 2011. His most recent role was as Head coach of the Canadian Men's Development team that finished 7th out of 22 teams in the 2015 World University Games in Gwangju, Korea. 2012-13 was Barnaby Craddock's first year as Head Coach of the Golden Bears Basketball program. Over the past five years he has led the Bears to a conference record of 91-33 (.734), qualified for the playoffs all five seasons, won the Canada West Conference championship twice (2014 & 2017), and won a U SPORTS National Bronze medal in 2014. Barnaby Craddock has also been an assistant coach with various other Canada Basketball national teams, including the 2011 FISU Games team that earned silver in Shenzhen, China, and Canada Basketball Men's (U-17) Cadet team (World Championships in Lithuania, 2012), (FIBA Americas Championship in Uruguay, 2013), (World Championships in Dubai, UAE, 2014). 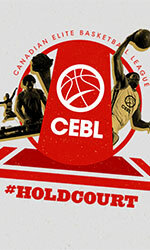 Modelled after top international professional leagues, the CEBL is comprised of six original teams in Hamilton, Edmonton, Guelph, St. Catharines, Abbotsford, and Saskatoon. Each team plays 10 home and 10 road games using FIBA (International Basketball Federation) rules, and player and referee standards set by Canada Basketball. Rosters will be comprised of at least 70 percent Canadian players, many playing professionally in North America and overseas during the traditional basketball season. Playing out of the Edmonton EXPO Centre, the Stingers will play ten home games starting with their season opener on May 10, 2019, at 7 p.m. against the Niagara River Lions. Season tickets range from $199 in the lower bowl to $750 for courtside and are available on the Edmonton Stingers website. Individual game tickets are expected to go on sale in spring 2019. For more information about the Stingers, visit https://www.thestingers.ca/ or www.cebl.ca. NIAGARA, ONT - The Canadian Elite Basketball League (CEBL) announced Thursday that it will be holding its 2019 Entry Draft Reveal on March 23, 2019 in Hamilton, home of the Hamilton Honey Badgers. Invitees will be present to witness top Canadian and international basketball players get announced into the CEBL through a reveal event that will unveil the picks made March 16 by the league's teams during the closed door CEBL Entry Draft. The invite-only event, which will be held at the Art Gallery of Hamilton, will also be live streamed internationally on CEBL.tv . that will educate and entertain fans of the CEBL. Further information about the live stream will be available at a later date. The order of the draft will be determined by a blind draw and announced publicly on Wednesday, March 6 at 9 p.m. Eastern time. Once the draft order has been determined the 13-round draft will follow a snake format, with teams selecting one through six in Round One followed by sixth through first in Round Two and so forth. The CEBL, the official professional league partner of Canada Basketball, opens its inaugural season in May with franchises in Edmonton, Guelph, Hamilton, Fraser Valley (Abbotsford), Saskatchewan (Saskatoon), and Niagara (St. Catharines). CEBL teams will play a 20-game regular season from May 9 to August 15, culminating with a league championship playoff at a site to be announced. The first four rounds of the draft will be have a regional focus as all CEBL teams will select only top players from their respective regions, allowing each team to have a nucleus of players from their own region. The three eastern clubs must select players based in Ontario and east, while the three western clubs must select players from Manitoba to the west. 'There is no dearth of talent when it comes to basketball in this country' said Joe Raso, Director of Basketball Operations, CEBL. 'Thanks to the league making key partnerships with Canada Basketball and U SPORTS, I am extremely excited to see how our rosters take shape as the CEBL becomes an elite platform for the development of the sport in this country'.